Crowned Buddha images were popular in the kingdom of Arakan, now part of Burma/Myanmar. They represent several different, yet related, ideas. First, they are a means of showing the Buddha's spiritual greatness. Secondly, the jewellery they wear connects them with the king, who was believed to be a future Buddha and was a major promoter of Buddhism within his realm. The main type of crowned Buddha has links with Yuan and Ming Dynasty (1279–1644) Sino-Tibetan art, which developed from monks traveling between the monasteries of Arakan, Tibet, and Bengal in India. This is one such example. The seated crowned Buddha sits in 'vajrasana' with one leg on top of the other on a double lotus base with one hand resting on top of the other in 'dhyanamudra', the gesture of meditation. In the flat of his upturned hands, the Buddha holds a lidded jar filled with the elixir of immortality, 'amrita'. He wears a five-pointed crown tied on with ribbons that flare out at the side of his head and with extensions that fall across his shoulders. Unfortunately, the knotted hair style that would have towered over the crown is now missing. A shawl is draped around his shoulders and arms that are decorated with bracelets, and he wears robes that cover his lower torso and legs. Two necklaces fall across the Buddha’s bare chest, the shorter of which is composed of loops and pendants. 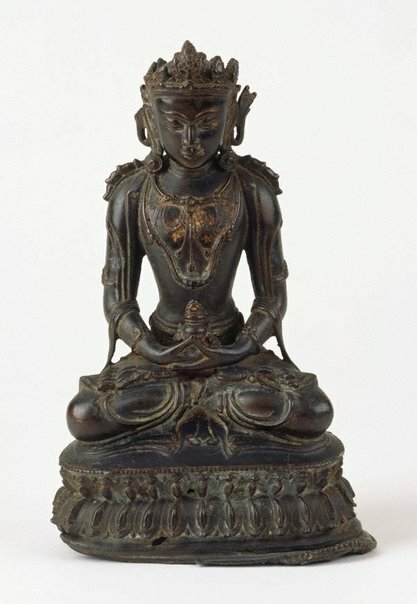 Although the iconography of the object is of Amitayus, a Mahayana Buddha, this image is simply a crowned Buddha image, because the Mahayana sect of Buddhism was not practiced in Arakan. The Arakanese incorporated this style of Buddha image into their practice of Theravada Buddhism and their beliefs about kingship. 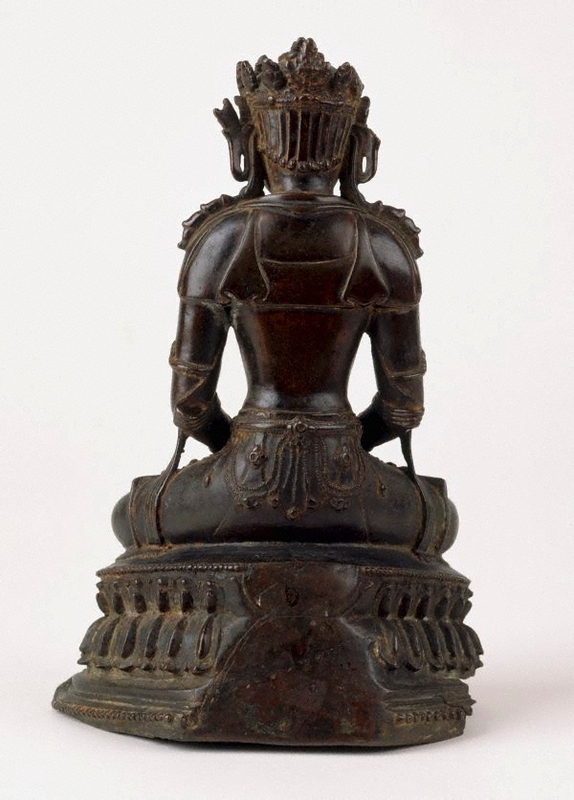 Images produced after the sixteenth century were influenced by the styles of Burmese and Thai crowned Buddha images. Burma's lost kingdoms: splendours of Arakan , Bangkok, 2001, 146-153.